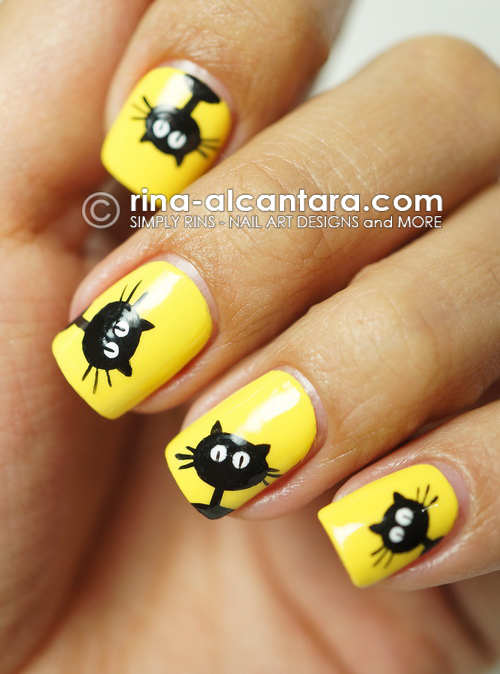 It has been a tradition here in Simply Rins that I feature Halloween nail art ideas every October. Here's the first installment for 2012 to start the ball rolling. My intention for this one is to come up with something attractive and crazy. Let me get to that in detail after I show you the nail art design that I named Black Cats Galore. I was actually hesitant that a bright yellow will work for Halloween. But after careful deliberation, I think it did! Well, I have to be honest that I really love the color and before I even cooked up the design, I was already decided that I'd be wearing the polish. I was not so sure if I could pull off such an attractive color. It was an attention grabber! I used 3 thin coats of Dazzle Dry Sahara for the background color. 2 layers would have been enough but I wanted to get a really bright finish. I have reviewed this polish here. As for the black cats, I hand painted them using acrylic paints, a detailing and stripper nail art brush. I have been getting a lot of inquiries whether or not my designs are stickers or decals. I would like to take them in as compliments. But just to clarify, the nail designs here in this blog are all freehand unless otherwise stated. Okay, so I think we covered how this design became attractive. Don't you just love the color? So, how was this crazy? The design is quite simple. I painted an oval head for the cat with tiny ears and long whiskers. The neck is exaggerated to be long and thin. I also wanted part of the body to show so I painted that too. Add 2 white dots of eyes and use a stripper brush to add a fine black line in the middle to finish the eyes. Having fun with my Black Cats Galore nail design. I now have ideas on using the thumb as accent nail for future designs. It would definitely make texting more fun! This year, I'd like to be more adventurous on the colors I'll be using for my Halloween nail designs. I'll be featuring the traditional colors, too. But I'd like to see if I could make other colors work for the theme as well. If you have suggestions for me, please let me know by commenting below. I hope you liked this attractive and crazy Halloween nail art design as much as I did. An alternative is to paint each nail with a different bright color. I think that would also work. You can view my previous Halloween nail designs here. What do you think of this nail art? Yellow is indeed attention seeker color but your design makes this color looks easy to look at. I love it. I love it! The cats are adorable. And that yellow is excellent. OMG!!! This is so cute! I might have to do this for my halloween challenge. I am inlove with these nails, I must do this, thanks for the inspiration! Oh no, so cute! I love the cats. Awesome!!!! I love how they are all peeking over you nails! Cats, I do adore!! Love this!!!! Hahhahha oh my goodness this is adorable!!! I love it!! I might have to try my own version of this one out I just love it! Aw, these look so cool ^_^ ! wow is the best black cat!!! Amazing!! I love cats <3 Do you wanna followeach other?? I love cats of all kinds & I think this would be awesome design anytime of the year. But I love the bright yellow background you used.